Thanks to Wiki for this moon comparison. This weekend the moon will be exceptionally closer to Earth and appear slightly larger. While you may be able to notice it by comparison, it also will affect us here on Earth. The moon has a strong gravitational pull on earth... 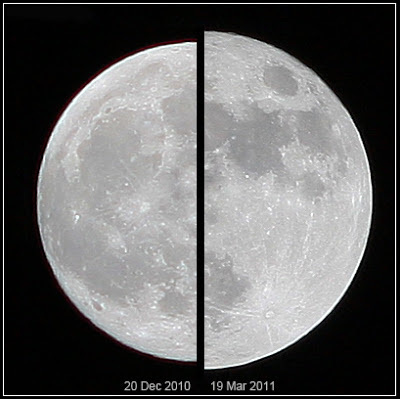 Yes, the moon and Earth may be far away from each other, but every full moon the low and high tide are exaggerated. With the sun pulling on one side of the planet and the moon pulling on the other side of the planet, the Earth actually stretches a little. Kinda sounds silly, but we are only a few miles of hard rock on top of a molten liquid beneath us. So if you are going to be any coastlines, you will notice it. Also with the moon being closer than the rest of the year there is unconfirmed beliefs that earthquakes and volcanoes can be triggered. The tectonic plates may shift a little more with the stronger pull. Anyway, keep an eye to the sky for Saturday night. A few people have asked about this, so I thought I would enlighten you all a little. Have a good one! PS. No changes to the forecast in my last entry. cool.Thanks for the lesson.Have always loved photographing these phenomenon.Tonight will be no different. oh yea, loved the green shirt last evenings' broadcast.That was a scream seeing the map through you!hahahaha. I am definitely a fan of ABC 6 news. So much better and livelier than others.